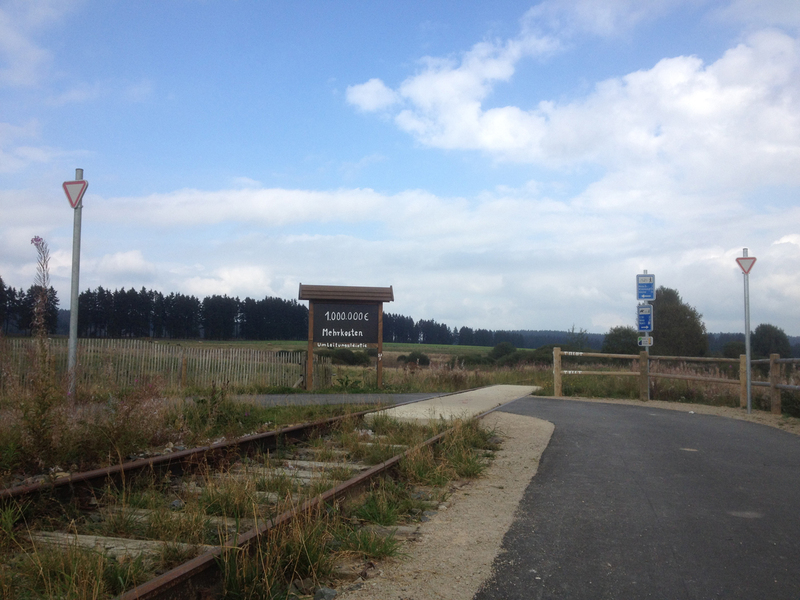 Today was a ride with a difference – 100 miles (162km) along a former railway track that linked Aachen with Luxembourg and travelled over the Hohes Venn in Belgium, also part of the Eifel region. I hadn’t heard about this route before but cycling chum Klaus mentioned it several weeks ago, that it was something he had wanted to ride for a long time, and it seemed to fit rather well with my wish to do a longer distance again. 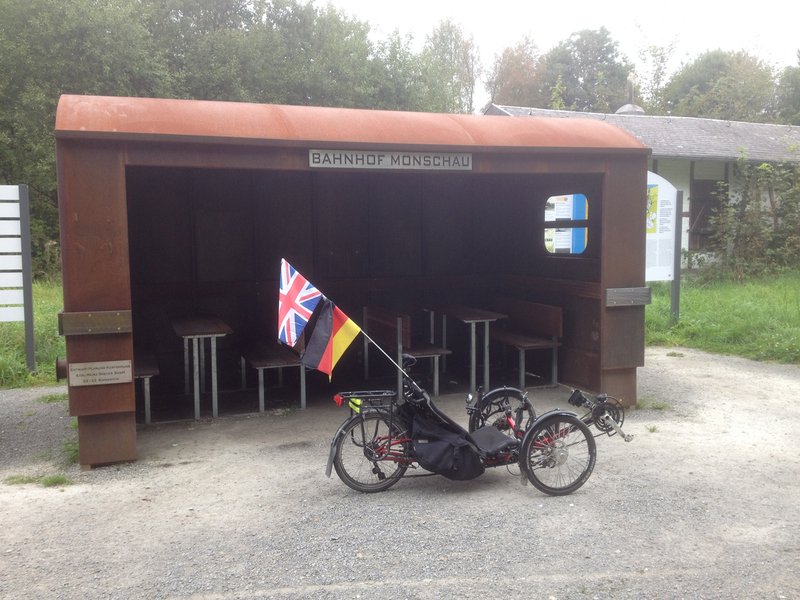 I’d ridden 100 miles three times in 2009 but hadn’t cycled that far since – the Vennbahnradweg seemed like a good opportunity to explore somewhere new and have a good long-distance ride. This was always going to be a long ride as it would start in Aachen (an hour and a half from where I live) so a couple of weeks ago we booked a date that we would make the attempt (assuming the weather wasn’t abysmal). Fortunately the forecast was fairly good for today – sunny and twenty degrees with possibly a few spots of rain now and again. The first issue with starting a trike ride somewhere other than you live is transporting the thing. Alfie folds very easily and will fit in a fairly small car but Klaus’s trike (now named Killer after he almost ran over a giant Nutria on a ride in the dark) does not fold and is also slightly wider and higher at the back due to its 26 inch rear wheel. 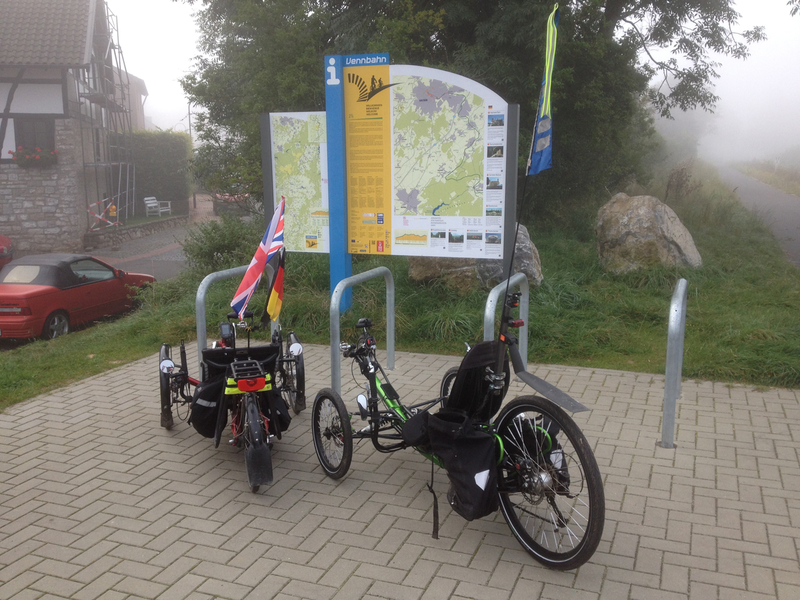 At one point we considered taking two cars to Aachen (one trike in each car) but that seemed a bit wasteful of fuel and I checked with my landlord and landlady whether I might be able to borrow their VW Bus. They were very happy for me to do so. 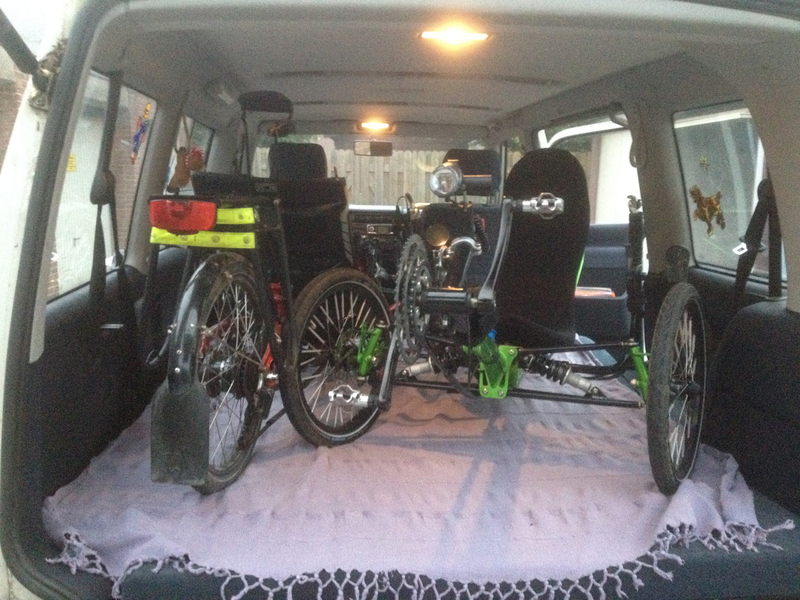 I realised the easiest way to transport trikes is on a flat surface and the VW Bus rear bench seat folds flat so Frank showed me how to do that and I readied the bus on Saturday evening, putting a cloth down onto the seats in case the bikes dropped dirt. I had arranged to collect Klaus at 7am which involved me leaving St Hubert at 6:30am. Yikes! So Sunday dawned and while it was still dark I headed off in the VW Bus to Viersen, Alfie in the back. Mindful of the weather forecast I had chosen shorts (rather than long cycling trousers) and my sandals which are most comfortable for a long ride. However it was fairly chilly first thing so as a last minute decision I added a pair of socks. Despite the appalling fashion disaster of wearing socks with sandals I am (a) over forty, and (b) living in Germany where that kind of thing doesn’t seem to be so much frowned over. 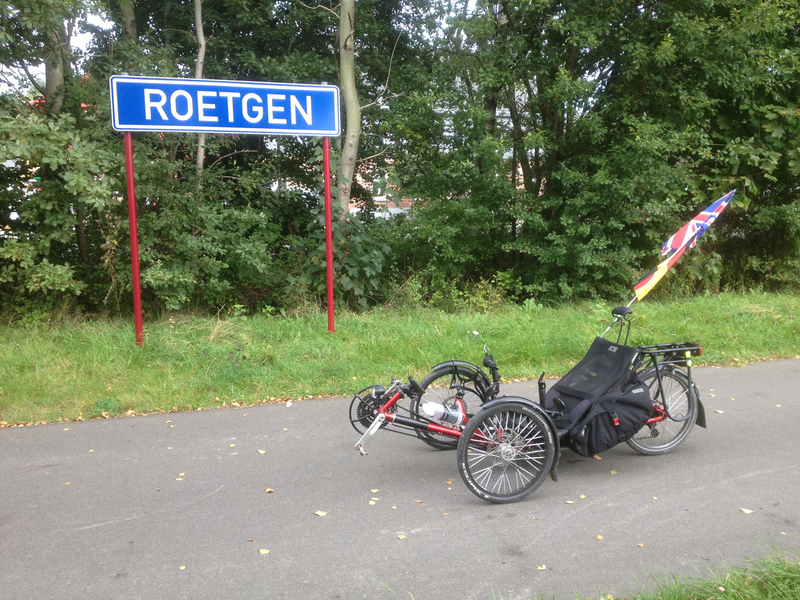 I arrived in Viersen and Klaus was ready with his trike. It took us a minute or two to work out the best way to tesselate two large three-wheeled machines into the bus but it all worked really well. We headed off to Aachen, Klaus giving directions (he had worked out a good place to park). There was very little traffic so early on a Sunday morning so it was an easy drive. The chosen parking spot was in an Industrial Estate five miles from the centre of Aachen – the Vennbahnradweg was just 20 metres or so from where the bus was parked. 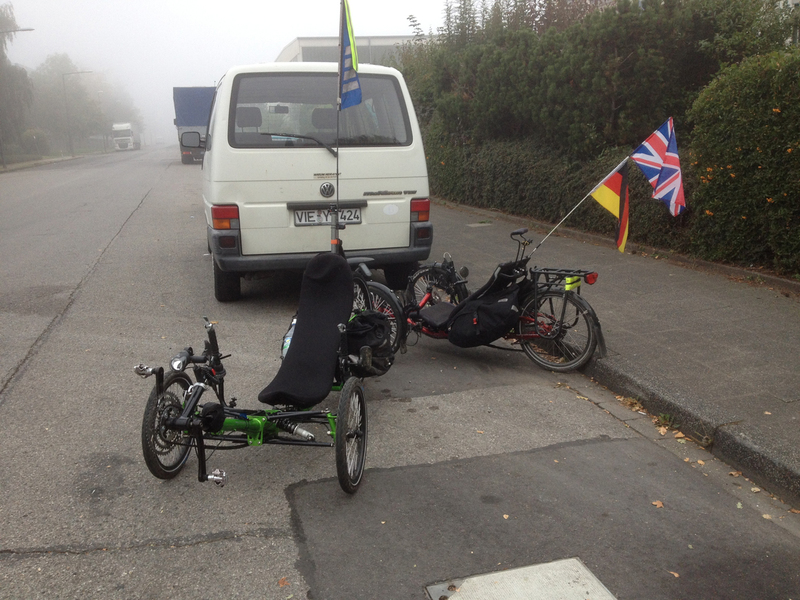 We extracted the trikes and got everything ready, feeling a bit chilly in the 11 degrees – me especially (Klaus had chosen to wear long cycling trousers, a waterproof jacket and autumnal shoes). My cunning plan about cycling 100 miles was, we knew, probably a bit too much of an ask for us. This was because I hadn’t reckoned with the fact that the route goes over a mountain range so the first 50 miles (if we did the 100) would be largely uphill. Not a particularly steep gradient but uphill is uphill, especially on trikes. Klaus had been unwell the previous week with a cold and still hadn’t entirely shaken it off and didn’t feel entirely fit when taking his trike for a quick spin two days before so we headed out with the assumption that we would ride as far as he thought sensible and then turn round and come back again (mostly downhill on the way back, fortunately). Here is what ended up as our track for the day. And here is the elevation profile – including heart rate data (orange) and speed (green). 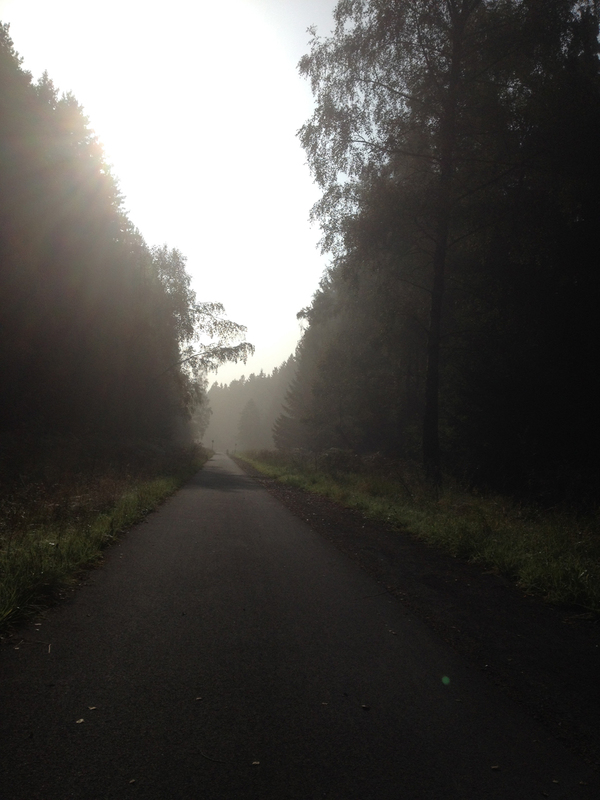 There was no-one about as we set off on our ride at 8:30am and we had the lovely wide, smooth asphalt to ourselves. This meant we could ride side-by-side which always makes conversation easier (with my hearing problems), although the initial section felt quite uphill so was hard work. I was keeping an eye on my heart rate to make sure it wasn’t too much too soon as that’s an easy way to exhaust yourself when riding a long way, so periodically I suggested we slowed down a bit. Working a bit hard up the hills would in some ways have been a benefit to me as I was definitely a bit chilly. I put a buff on my head which helped a bit but I rather wished I had chosen long trousers. I consoled myself with the thought that when the forecasted sun broke through around lunchtime and it reached 20 degrees I would feel much more comfortable. The route was very well signposted (except for one short section fairly early on) and there were also loads of information boards as we voyaged forth. This one had a rather nice bit of English about slumbering cyclists – that wasn’t in the German version at all! The blurb talked about the beautiful scenery and it was nice, in a rather misty kind of way. There was a lot of fog about which meant we couldn’t see too much but the sun filtering through the mist and the trees looked great. After the first few miles we had escaped the outskirts of Aachen and climbed a fair way, now reaching pine forests with no sign of habitation or other people. The track crossed very few roads after the first few miles so it was a long, easy cycle (apart from the slight upward gradient) without having to pay attention to routefinding or other traffic. We just pedalled along, chatting and enjoying the scenery. The route was on an old railway line but there were still traces of the railway in places – there are clearly sections that still have trains running on them as there were crossings from time to time. The fog hung around a fair bit, I suppose as we were getting higher up, but as we weren’t dodging traffic it wasn’t a problem. By eleven o’clock the mist was clearing and the sun made more of an appearance although it was still not that warm. It had warmed up enough for me to take off the buff on my head and use my baseball cap instead but that was about it. I was glad to have my socks! There were now a lot more cyclists too – we were regularly having to single out as people were coming the other way. This can be harder than you’d think on a trike as you may be pedalling along side-by-side at 25km/h and you see someone coming the other way. The person on the left stops pedalling and waits to tuck in behind the person on the right but the aerodynamics of the trike mean you don’t actually slow down that much so it takes a while before you can tuck in (using the brakes feels like a waste of energy). The person on the right tends to also speed up a bit to help things along but we were occasionally shouted at by random Belgians. 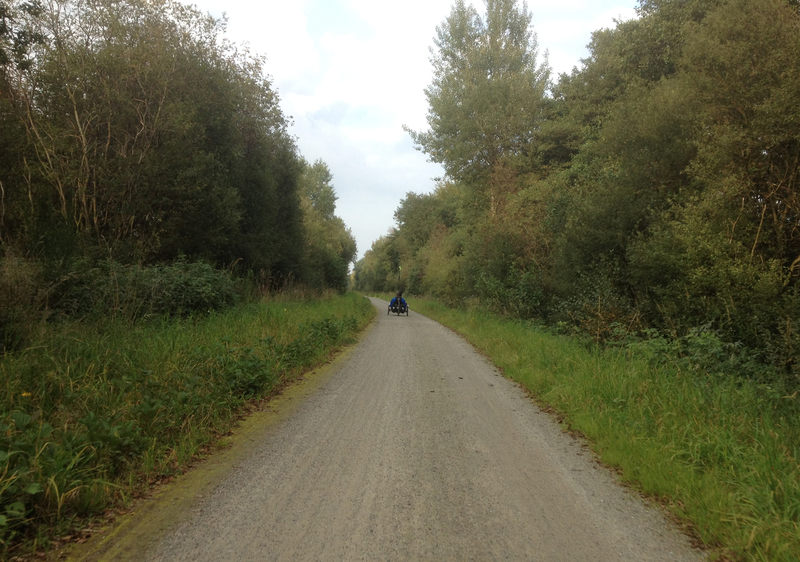 There was always plenty of room as it was a wide path – and we were shouted at one time by two Germans cycling side-by-side. Still, when the Belgians shouted at us we couldn’t understand what they were saying so that was OK.
As with other Bahnradwege, there are quite a lot of train-related things left along this route. The station nameplates are a good example. Klaus has a tendency, when riding, not to stop for food/cake but he’s ridden enough miles with me to know that I like to stop and have a break (and cake) regularly. We didn’t pass very many food places at all (unlike lots of German cycle routes I have been on before where you are knee-deep in Biergärten the whole way). We stopped for an apple/banana after an hour or so but by 10:30 I was beginning to think about having a longer stop (with a loo opportunity). Klaus suggested, as we were fairly close to Monschau, that we stopped there – he knew of a restaurant that did the most fantastic Schnitzel mit Senf, apparently. 11:30am seemed quite early for Schnitzel to me but he looked keen so I thought, why not! 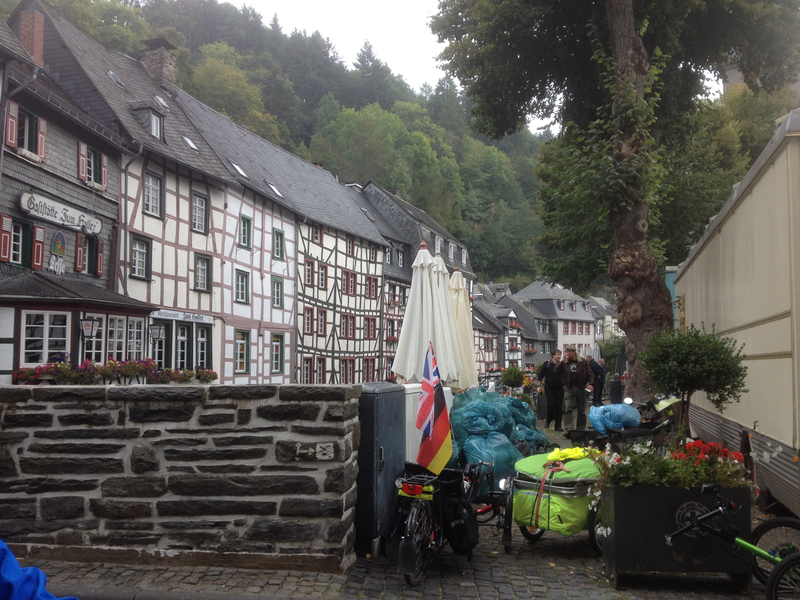 So after another hour’s cycling we arrived at Monschau. Like lots of the towns and villages we had passed, they had a little seating area. 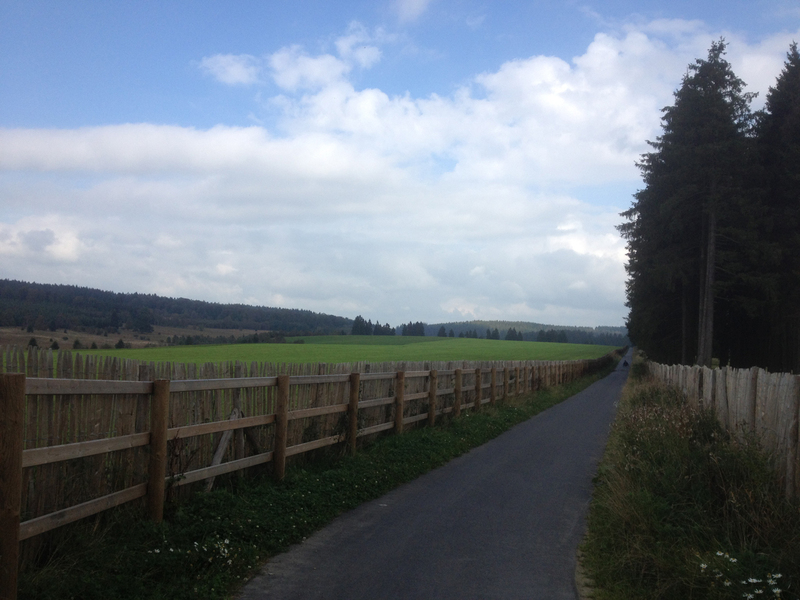 However, it became clear that we were actually 3km from Monschau centre. Klaus was still keen to visit the restaurant but warned me it was a long downhill that would require an uphill afterwards to get back to the Bahnradweg. 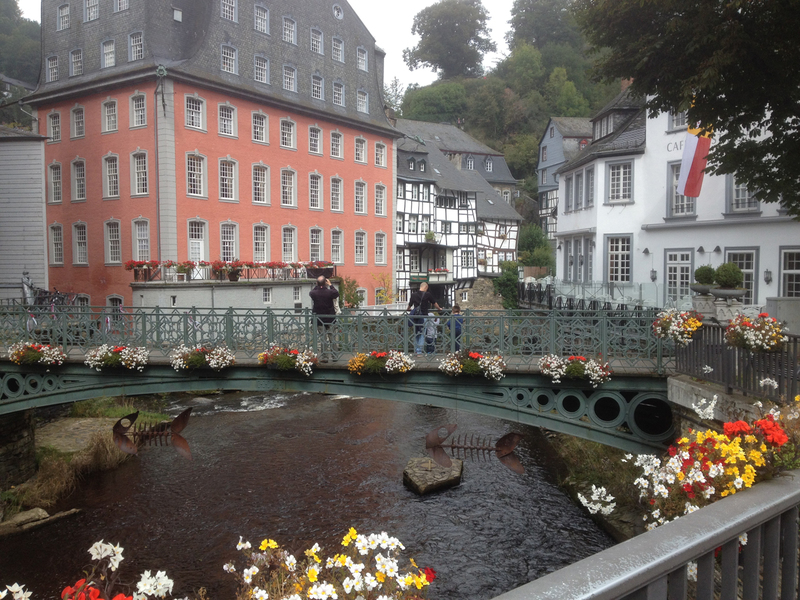 This was not a problem, I didn’t mind a bit more climbing, so we headed off down the main road to Monschau. 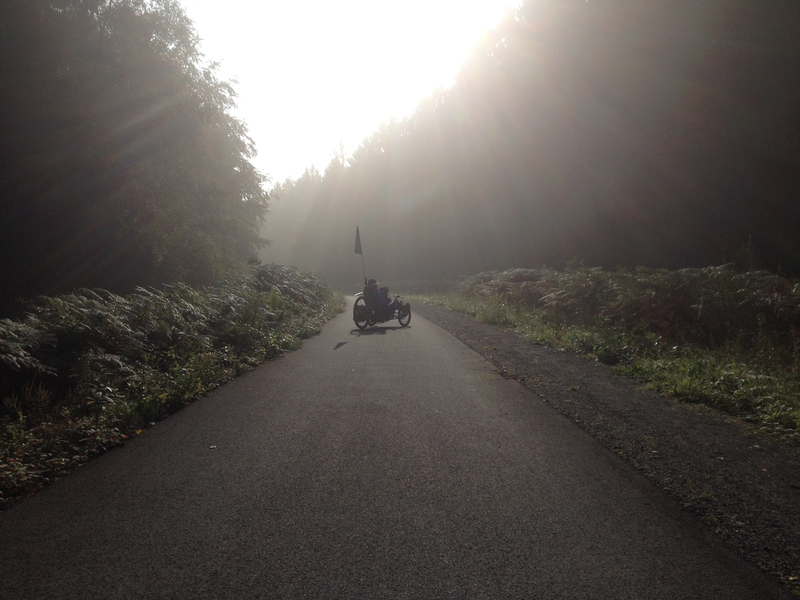 Which was a lovely fast road where the trikes got up to 50km/h easily. We whizzed down the hill (which was clearly going to be hard work going back up again!) 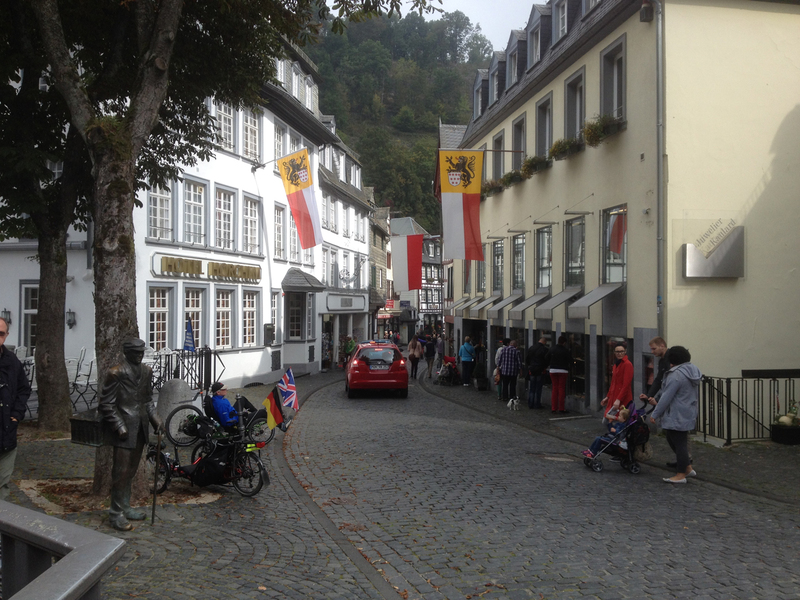 and then turned off the road into the main part of Monschau which is pedestrianised and cobbled. There was a fairly long cobbled section and it was so bumpy for me on the trike that my vision started to go a bit wobbly. It was a very peculiar sensation! We arrived at the restaurant Klaus so liked – and it was closed! Oh no! 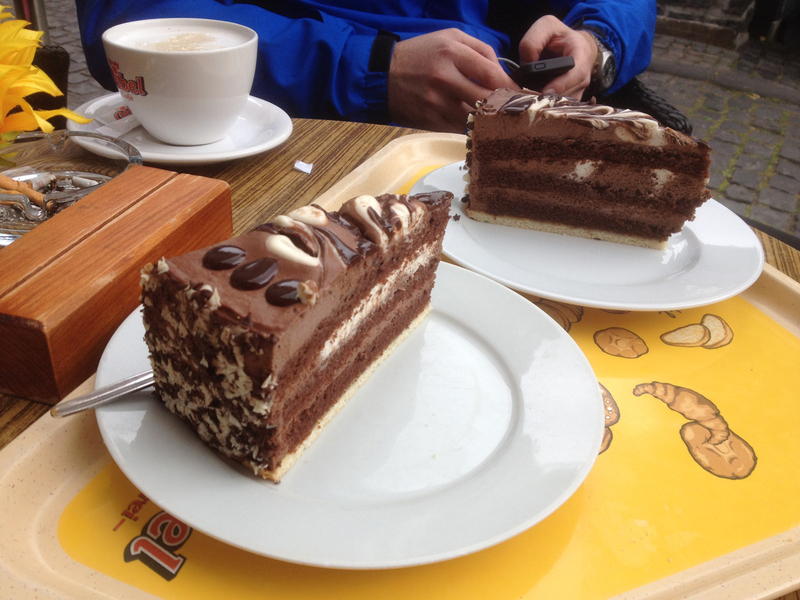 Still, there were plenty of other opportunities for food so we took ourselves to a bakery for some cake. The bakery was in a building right next to the river Rur. This is not the Ruhr (where lots of German industry is) but a different, similarly-spelled river also in Nordrhein-Westfalen. There were lots of beautiful Fachhäuser to look at – although I gather owning one of these is even more nightmarish than a Grade 1 Listed house in the UK! After our cake and tea it was time to head back – over the cobbles. Klaus said that his ride over the cobbles hadn’t been too bad. Mine had been really rough (not helped by having Kojak tyres at quite a high pressure, I suppose) so he suggested swapping trikes for a bit to see if we could notice a difference. Boy, was it different! On Klaus’s fully-suspended Wild One the cobbles barely noticed. He’d said this to me before and I assumed it was hyperbole, but indeed it was a very smooth ride, very comfortable (apart from the seat which doesn’t work for my shape). Klaus was behind me on Alfie undoubtedly discovering why I am rather slower across cobbles and probably hoping none of his teeth fell out. I very meanly carried on riding the Wild One till we were back on proper asphalt and then we swapped back to our own trikes. This definitely gave me food for thought though – I tended to think previously that the complicated suspension on the Wild One was a bit unnecessary for normal riding but it clearly has its benefits if you live somewhere with cobbles! 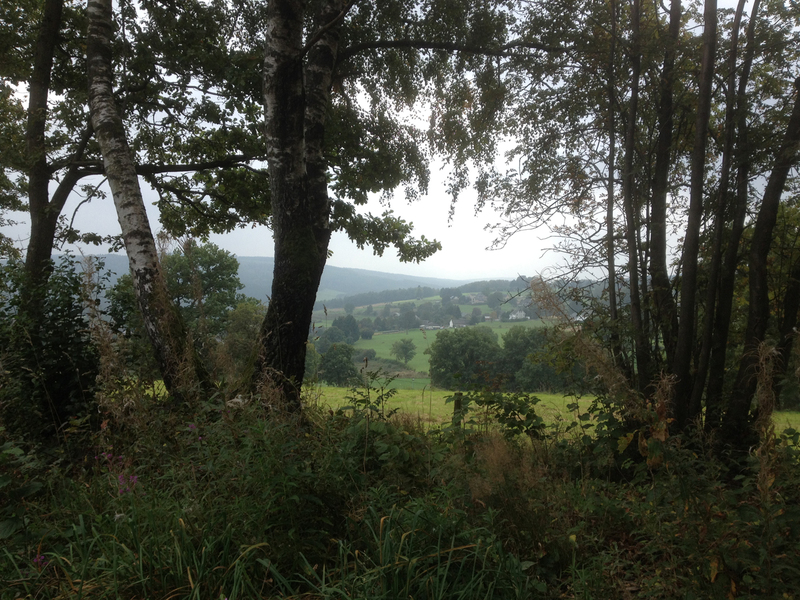 As we had been whizzing down the hill from Monschau Bahnhof to the town I had noticed what looked like a shortcut back so we decided to take this. It would undoubtedly be steep but hopefully without many cars so it doesn’t matter if you ride slowly. Sure enough we took the turning on the way back and started slowly working our way up the hill in some of our lowest gears. As we rounded a corner, having covered about a third of the distance back to the Bahnradweg, the asphalt disappeared and we were faced with gravel/stones/Schotter. Klaus went first – and lost traction after about three metres. I sat on the asphalt considering the predicament. It would be a long haul uphill on the busy road if we returned the route we had come – we had probably less than a kilometre to ride on this gravelly path. In the end we decided to carry on the only way possible at this point. Fortunately the track fairly soon flattened out enough so that we were able to ride again, albeit with occasional traction issues. 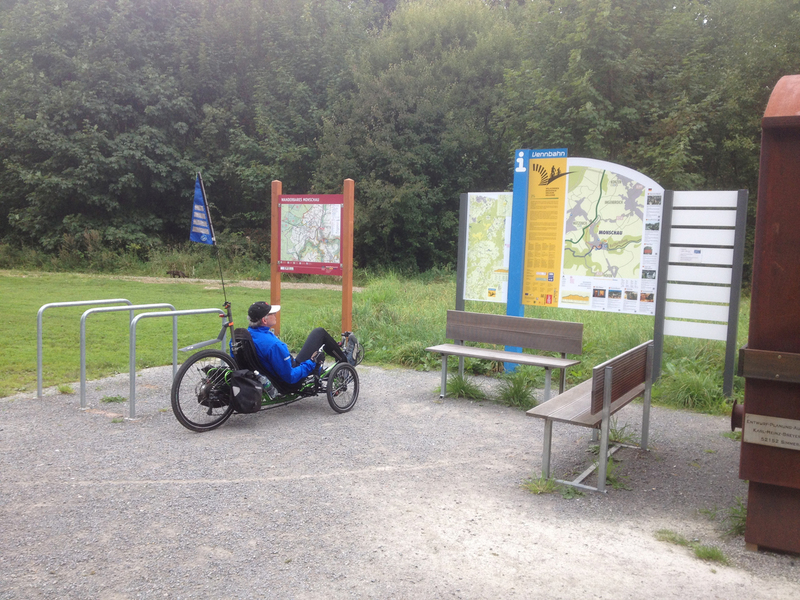 This is a perennial problem with recumbent trikes – the rider’s weight isn’t really over the traction wheel so as soon as you get to loose surfaces or mud it can be hard to make progress. We made it eventually – a very steep walk and ride up a hill – and had to have a bit of a breather at the top before carrying on. 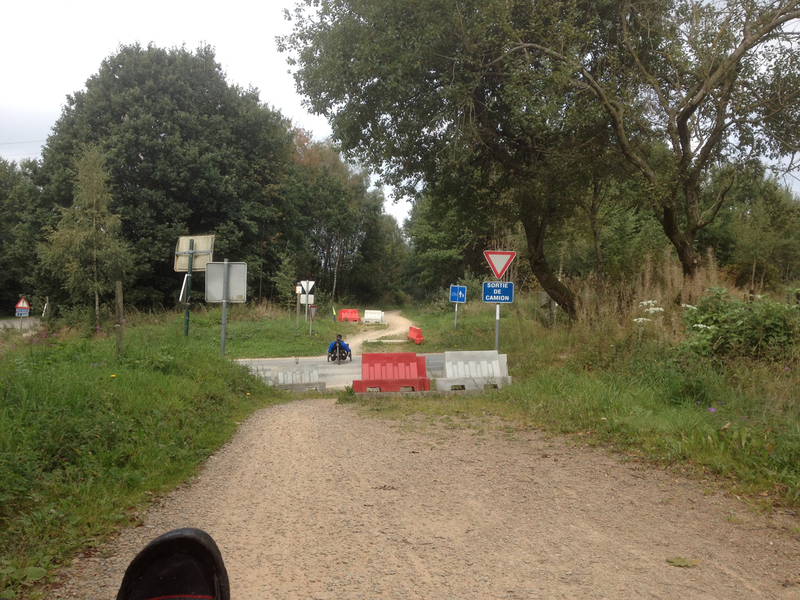 The wrong way, as it happens – I hadn’t noticed that the Bahnradweg was higher, we were just on an access road to a farm. We realised soon enough and turned round, went right back to the Bahnhof Monschau rest area that we had been at a good hour before, and got back on the right track. Early on in the ride we’d briefly been into Belgium (which of course prompts a whole batch of “Willkommen in Belgien” text messages to all our phones) but had mostly been in Germany. After we headed south from Monschau we went into Belgium proper… again, not really noticeable (no text messages this time) except for slight differences in signage. This one was a bit of a giveaway though! As you can see, we were also at this point riding on Schotter rather than asphalt. This is annoying for me of course, but we knew it would be a short bit of riding. 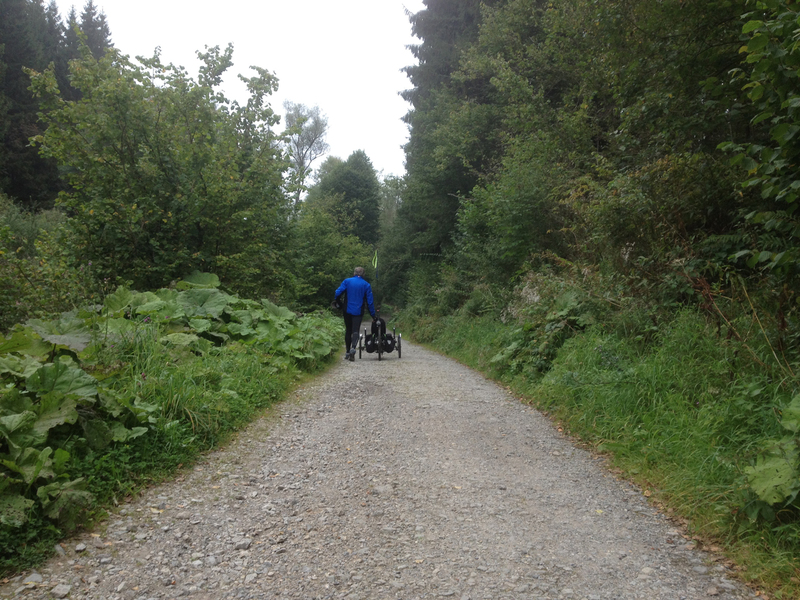 This was because despite not feeling entirely fit Klaus had decided to carry on after Monschau and as the path had been smooth and relatively flat we had covered a good distance. The original plan was to cycle either 161km (100 miles) or 166km (further than I had ever cycled in one day before). I’d shelved this plan at the beginning but it was coming back as a possibility when the Garmin read 75km and we were still heading towards Luxembourg. The detour into Monschau centre had added about 5km to our track so we knew we needed to ride more than 80.5km before turning round if we were to get back at 161km but the Schotter was annoying so in the end we decided to turn round a little bit early and have the option of riding a bit further at the other end (we had parked 5km from Aachen so could always ride a bit further towards Aachen and then turn back again). 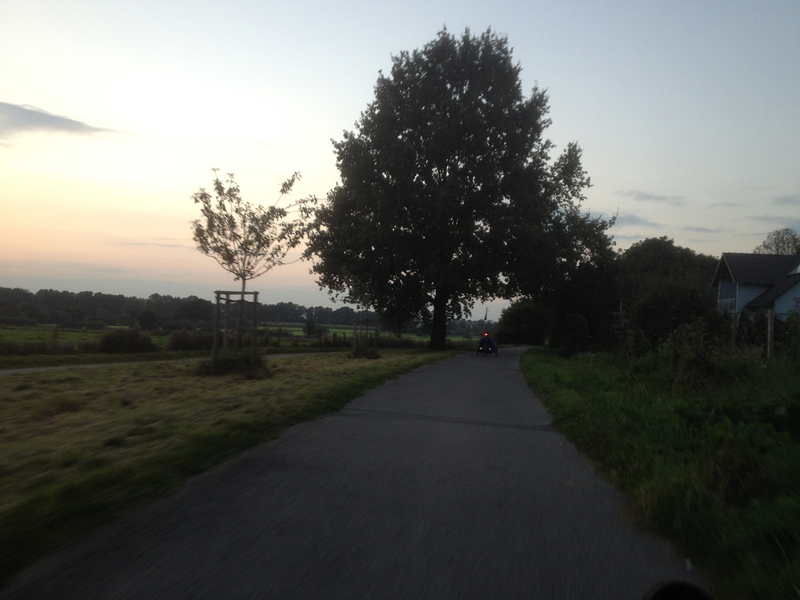 So… we reached a small crossroads in the Radweg and stopped to turn round. Notice on the seat of my trike a Union Jack item? This is my Emergency Chocolate ration (“British Chocolate”) given to me by my friend Kirstie when I was in England in June. I had kept it in my flat for emergencies and had, as yet, not been so desperate that I needed it (despite the fact I haven’t allowed myself to buy any chocolates or biscuits from the Griesson de Beukelaer factory for the last three months). Anyway, as I am returning to England next weekend I thought I ought to bring this chocolate on the trip for an energy boost. So we shared the bar of milk chocolate (kind of like an aero but a bit melted) in Belgium looking across at the hills we had cycled up. 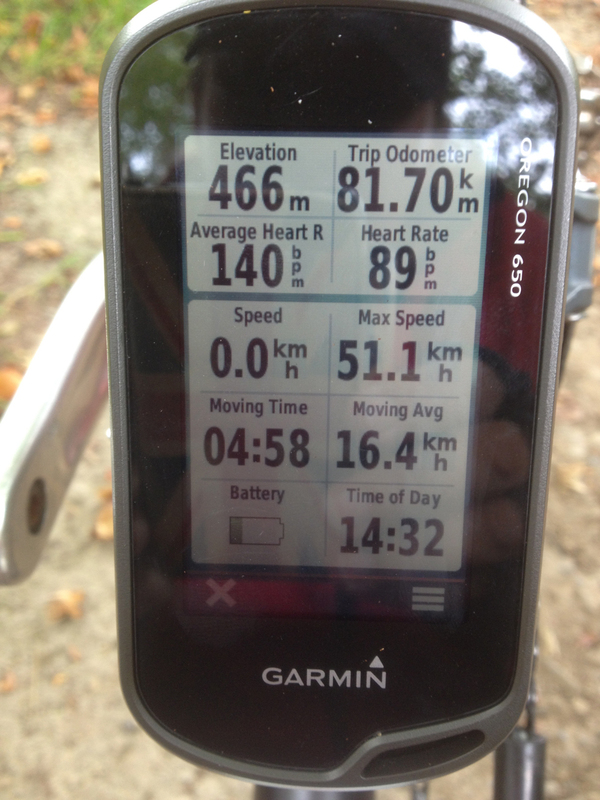 And here are the statistics on the Garmin at the turning point. As you can also see, the new Garmin Oregon, although an excellent bit of kit, is a bit thirsty with the batteries – I changed the batteries shortly after this and the replacement only just made it to the end. Fortunately it takes AA rechargeables but the old Oregon (which I also had along as a backup) lasted almost the entire ride on one set of batteries and they weren’t newly charged when I started it up. 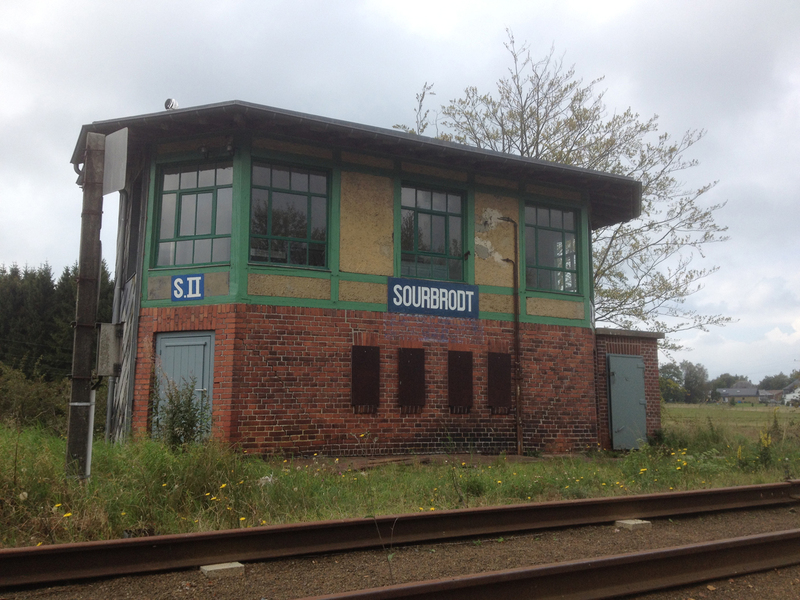 So now we turned round and started heading back towards Germany, once again on the Schotter (for just 2km). This should be a generally downhill route now but it didn’t always feel like that. The route was also very busy with cyclists and families out walking so there were lots of ‘hellos’ to people, although we were rarely passed by other cyclists (only those on racing bikes as we are quicker than general cyclists). There were some interesting place names underway. 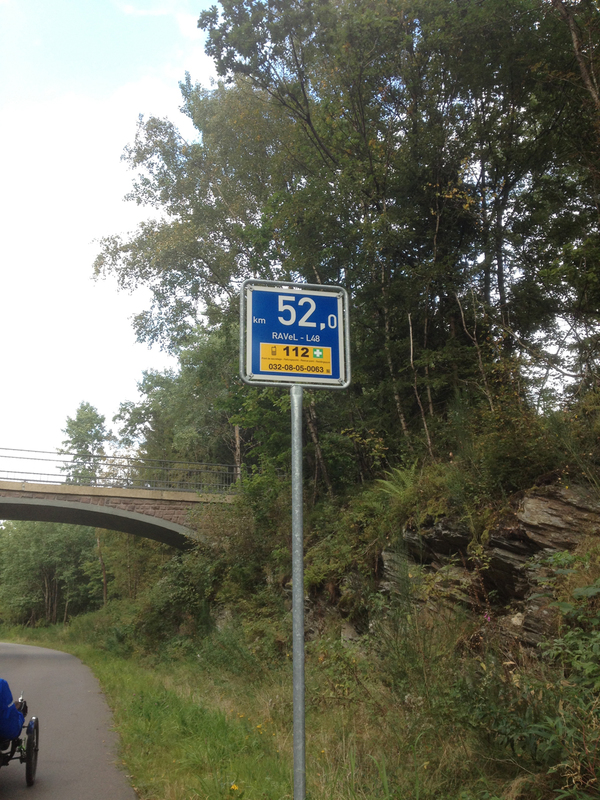 And I found this an interesting sign as well – this was either end of a 5km-long stretch of perfect, smooth asphalt. Clearly someone local didn’t like the expense! This whole section is just fantastic though – smooth, fast, flat, with some great views. On our outward journey we’d passed a café built into an old train which also had a lot of strange open carriages in front of it. On our return journey we passed about 20 of these actually on the tracks – obviously some kind of amusing pedal-power train car. I quite fancied having a go but we didn’t really have time! We were both feeling hungry now and as it was approaching 4pm that felt like time for lunch. 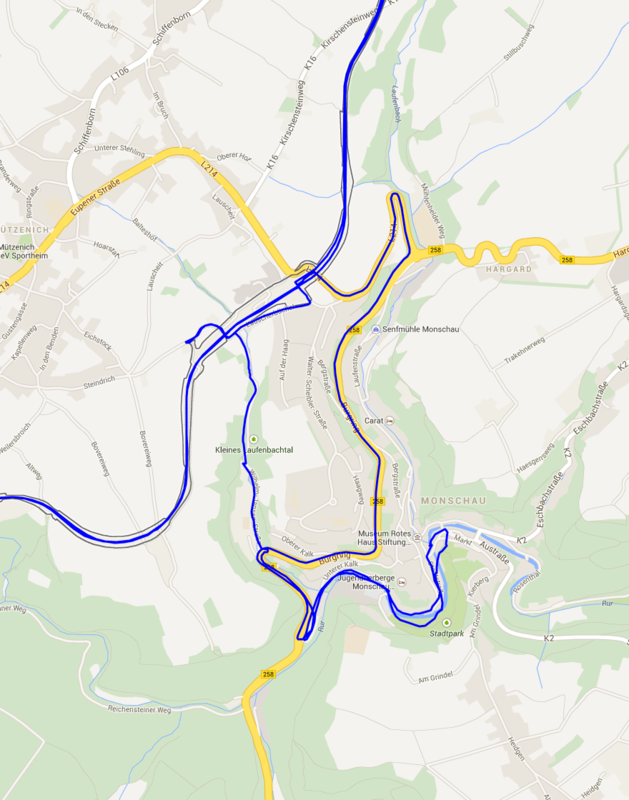 Cycling friend Hartmut had recommended a place to me in Küschelscheid and I had made a waypoint on my Garmin for it. I saw this approaching so suggested to Klaus that we stopped there. It was a bit off-route (about 1.5km) and Hartmut had said it was up a hill but we thought we’d give it a go. So we turned off the route at the relevant section and headed towards the café. Which was up a COLOSSAL hill, a real killer. We turned the pedals in our lowest gear and eventually made it, feeling rather worn out. It was an interesting café with lots of people outside and in. We sat outside but realised fairly quickly that there was only one woman serving, there were lots of other people still waiting for food, and the food choice wasn’t really what we wanted. After ten minutes of sitting there with no sign that the lady would come to take our order we decided to go somewhere else. 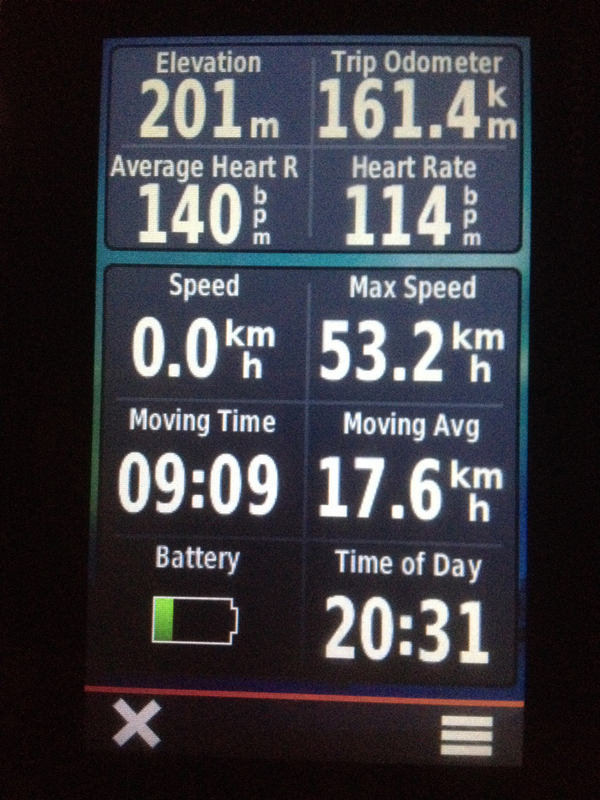 So we headed back down the awful hill and reached a top speed of 53km/h. At the bottom of the hill I saw a café and grabbed at my brakes to stop; there was a nice smelly brake pad odour but Klaus carried on saying we’d try somewhere else. The thought was to eat something in the train carriage on the tracks (where the weird pedalling things were), we’d passed it on the way to the café. So we arrived at the train carriage, sat down on a table outside and noticed that they were only serving waffles. As nice as waffles are, we both felt like we needed more in the way of carbohydrates. 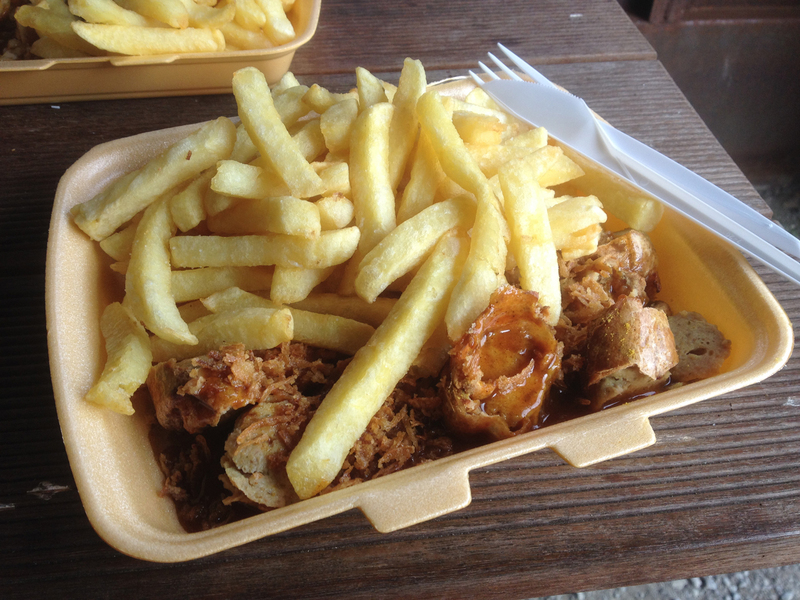 “Let’s go to the Imbiss” said Klaus and I agreed – that would have chips! (although not a toilet). 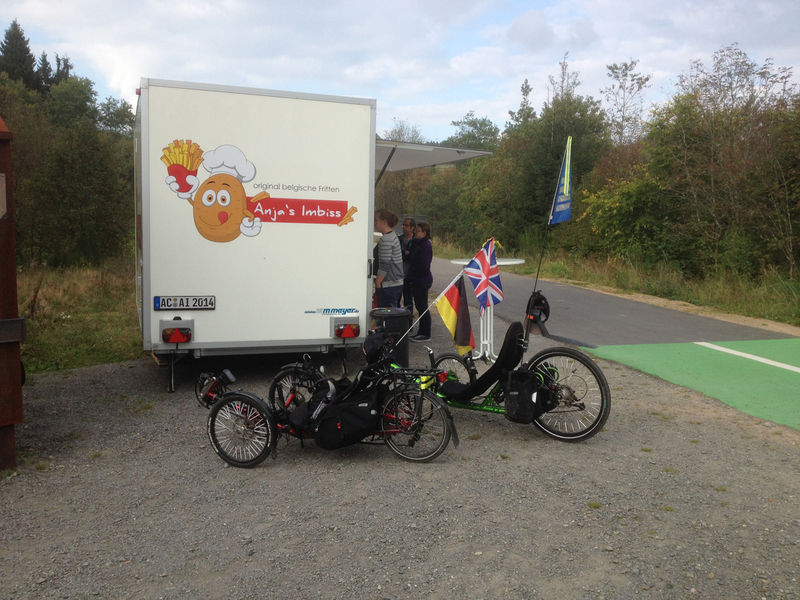 So another 20 metres by trike and we arrived at Anja’s Imbiss which had a smallish queue. There were chips and currywurst and burgers and other options. However, it didn’t take more than a minute to notice that Anja had not really got the hang of time-and-motion. She seemed to be cooking to order (including chips), doing one order at a time, and not finding out if anyone in the queue wanted something that was already available (currywurst). Klaus really wanted a can of coke, which she had in the fridge, but she didn’t ask ahead. So we stood and waited, stood and waited. She served five people in front of us but we were both bemused to notice that when she finished the cooked chips, she didn’t put any more on to cook, although there were four more people in the queue. So when we placed our order she then stuck our chips in to fry. At least the currywurst were ready (which was why I had chosen that – otherwise I would have had a burger). What was also annoying was a man (who clearly also worked for the Imbiss) had arrived and asked if she needed help and she said no – Klaus and I both thought she definitely did! It was a strange experience of Belgian food provision in one village – three different options, all of which seemed a bit hopeless. Do they not want our money? Finally the currywurst arrived and we sat in one of the ubiquitous shelters to eat it. 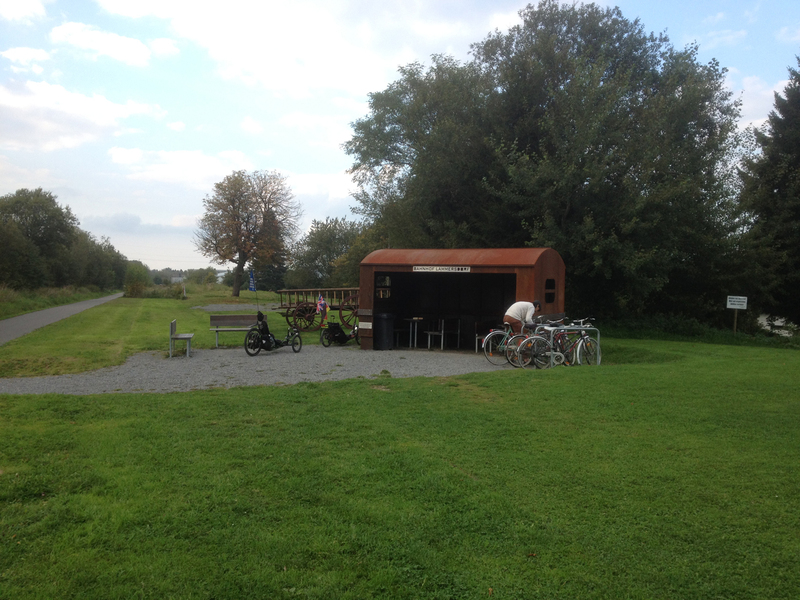 The short food stop had taken well over an hour which seemed crazy but we were ready to carry on fairly quickly although I find after eating greasy chips (which were tasty) my stomach complains a bit if I cycle too fast. So we pootled on, still waiting for the wonderful downhill section we knew must be coming (as we had ridden a long way uphill at the start). The route has regular signposts in the Belgian section with the countdown to Aachen. 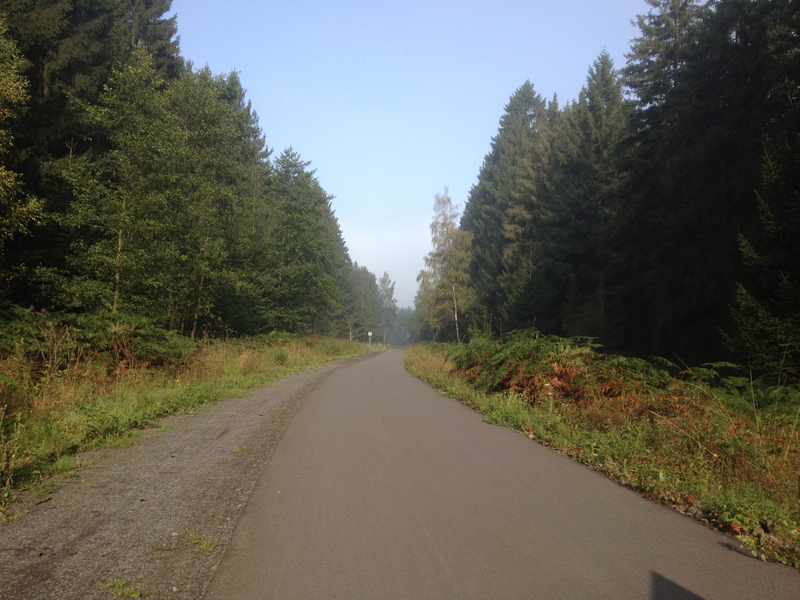 We had started 5km from Aachen so had to knock 5 off all of these for our distance back but it became clear because of the Monschau detour we would get back to the car before the 100 miles. We agreed to decide what to do then – I thought I could always head off for few miles to bag the 100. Klaus, being metric, was possibly less bothered by hitting this magic number! I had forgotten there was another section of Schotter on this part of the route. On our outward journey we had swapped trikes briefly to see if the reason I ride slowly on it is to do with Alfie only having rear suspension; it was an inconclusive test but I still find it hard work. However this photo shows the common sight when I am riding on Schotter – my riding partner, whoever they are, pulling a long way ahead because I am so slow. 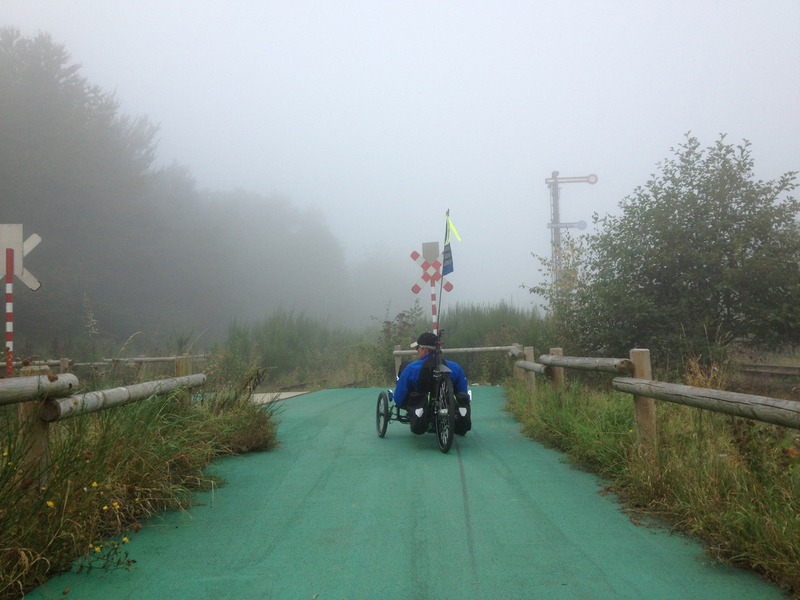 We had now ridden further than Klaus had ever been in one day and he started to have issues with his feet (quite common with recumbents because your legs/toes are so high up). He explained this to me in one of his excellent little English phrases which are rather influenced by German: “my feets are sleeping away”. So it seemed like a good idea to stop and walk around for a bit to get the blood flowing back into the toes – plus I wanted a drink. So at the next little stopping point we had a wander, read the signage about the area where we are, ate some more of the emergency chocolate and had a five minute argument about whether dishwashers are more useful than husbands. The sun was heading to the horizon now but we had finally got to the excellent downhill section. This was really fast – we were averaging 32 km/h for long stretches, probably for 10km or more, so the distance to go was counting down rapidly. Klaus has 81 gears on his trike and so his top gear is much higher than mine and I was having to pedal quite fast to keep up with him. But it’s such brilliant fun riding this fast on a path with no traffic – and the other cyclists had mostly gone home now so we generally had uninterrupted progress. I reckon in the velomobile I could have enjoyed this part of the ride at 50km/h. The distance was counting down, we had switched on our lights, and soon we were in the busier section of the suburbs of Aachen with lots of road crossings. Klaus phoned his wife to say we just had three more kilometres to do but when we arrived back at the area where we had left the car we were on 97.5 miles. Except were we? My Garmin was giving a different reading to Klaus’s Runtastic software on his iPhone (which uses a sensor on the wheel to measure distance). He tried to explain to me that as the Garmin isn’t taking into account elevation with its distance (it assumes you’re on the flat), it is under-reading. His phone believed we had cycled 1km further than my Garmin. I argued that he couldn’t be sure he’d measured his wheel circumference perfectly and if it was a couple of millimetres out then his distance measurement would also be out. After a day of cycling with someone it’s quite easy to find things to argue about!!! Anyway, he agreed we really ought to get to the Imperial Century as we were so close so we continued on the Radweg towards Aachen, still downhill. And I insisted on using my Garmin’s measurement as that’s what I’ve always used for my distance measurements. 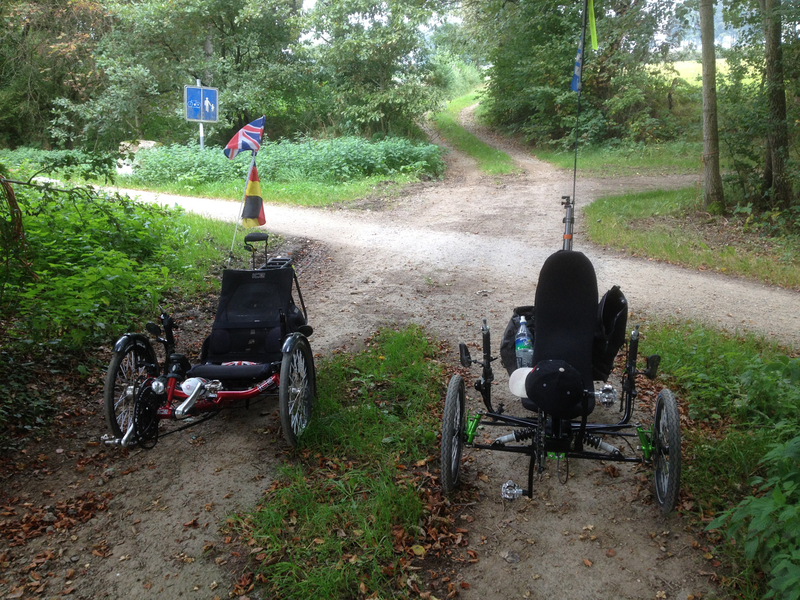 At 98.75 miles it was time to turn round and head back again – unfortunately uphill! The last mile and a quarter was hard work (not least because my Garmin was using Imperial units and I’m used to kilometres going past rather more quickly than miles). But lo and behold the Garmin clicked to 100.0 miles just before we reached the car – hurrah!!! 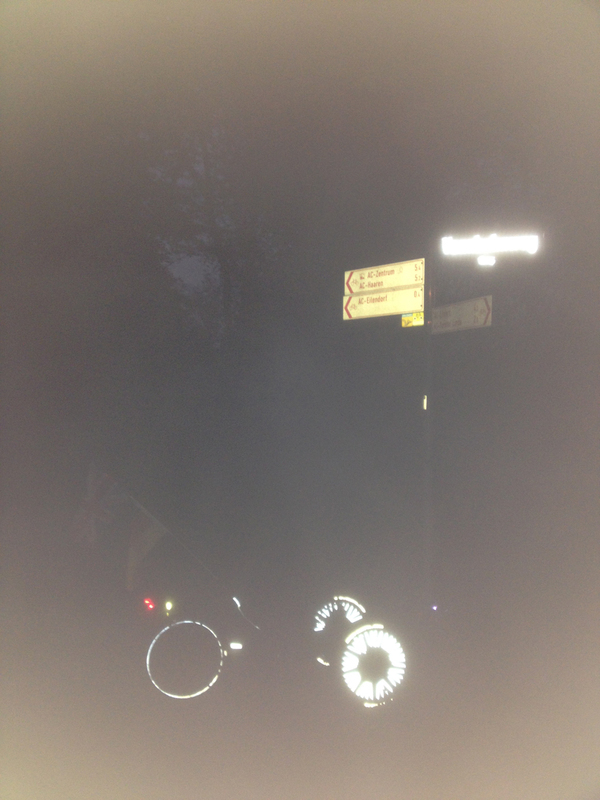 I realised I hadn’t got a photo of the Vennbahnradweg signs that we had seen all day – it was rather dark but I made an attempt at the sign where we had parked the car. As you can see, it was not a success!! 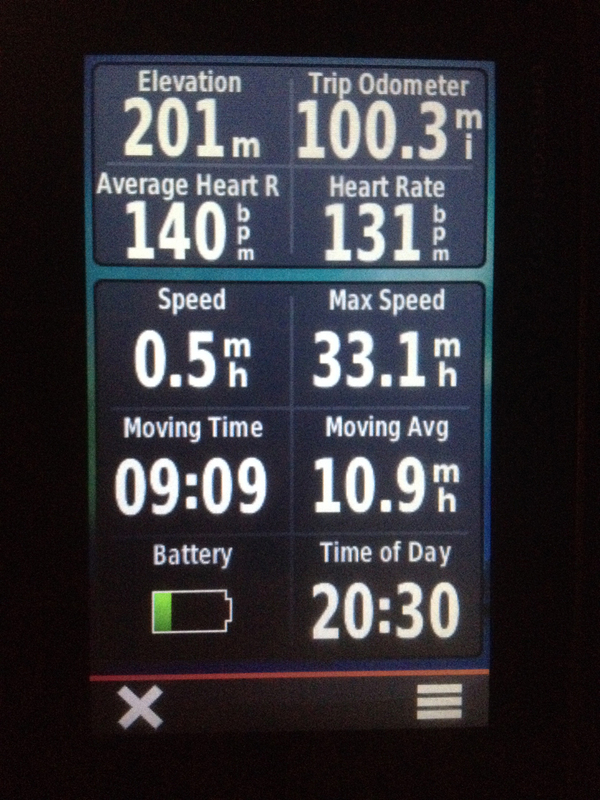 Here is the proof from my Garmin in Imperial. 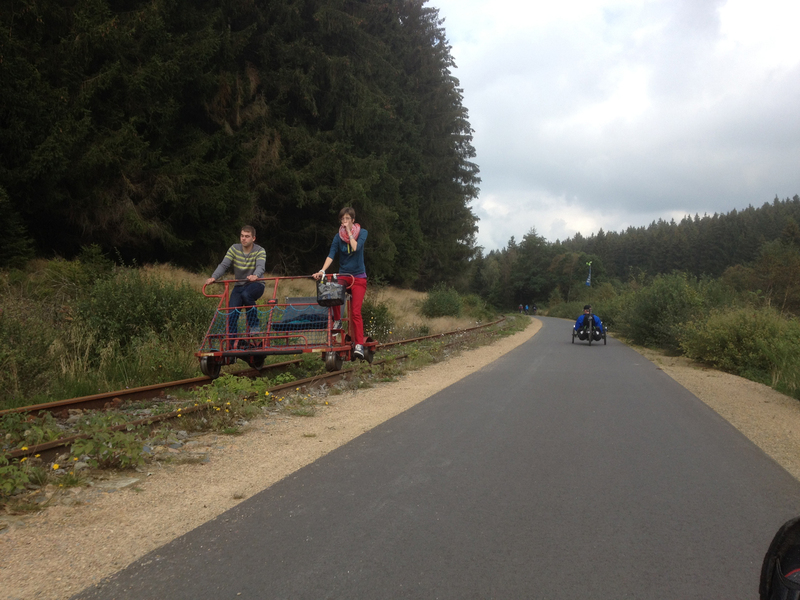 It took five minutes to get the trikes back in the car and then we were off back to Viersen and Kempen. All in all it was a great ride – a real achievement for us both, but especially for Klaus who was still recovering from the lurgy. He made the better clothing choice (the promised sunny, warm day never arrived so I was sometimes a bit cold) and he also won on the number-of-stops thing as I usually like to stop every 25km or so and we only stopped twice in 162. 100 miles in a day is a fairly major milestone, the next being 200km in a day but I think that might be too far at my speed. Certainly the Vennbahnradweg was an excellent choice for a distance ride as there were so few road crossings but if it’d been flatter that would have made the first fifty miles a bit easier! After downloading the track to my computer I got my more accurate figures. Klaus’s figures (after downloading to his computer) are in red. He didn’t have a HRM today. Well done Helen 🙂 100 miles on a trike with hills as well is a worthy achievement. I am sure it would be much more difficult without cake.